I cringe when the word ”Improve”, or “Improvement” is used about land. It’s applied, of course, to describe the process that adapts land for human uses such as farming or construction. This isn’t improvement in any conventional sense of the word. In the 500 or so year history of European use of American land, the most “improved” land type victimized by this euphemism were wetlands. About half of the wetlands that existed in what is now known as the United States have been lost to agriculture, housing developments, cities, (Chicago, Washington), and infrastructure. It was not until the mid 20th Century that governments began to catch up to science in seeing the essential value of such land forms, and that steps such as the Clean Water Act were passed to protect these critical environments. So what? Why are wetlands so essential? To many, wetlands are little more than messy, wet, unusable land that harbor snakes, mosquitoes, chiggers, biting flies, and in some areas, alligators. The best thing that can happen to such pestilence is to fill it in and build a Walmart on it! Improvement! The answer, therefore, to the So What question rests in the function that wetlands provide. 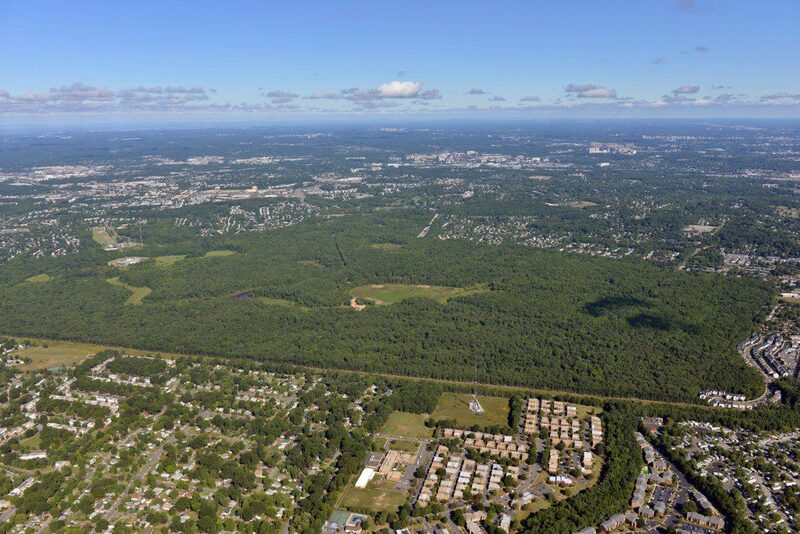 As seen from the air, Huntley Meadows is a vast fresh water wetland surrounded by some of the densest development in Fairfax County. Photo courtesy of Wetland Solutions, Inc.
Virginia’s inventory of wetlands is impressive. We have about 1 million acres of wetlands, both fresh water and salt in Virginia. Although most people associate wetlands with the coast, more than 750,000 acres of the Commonwealth’s wetlands are non-tidal, meaning they do not fluctuate with the changing ocean tides. 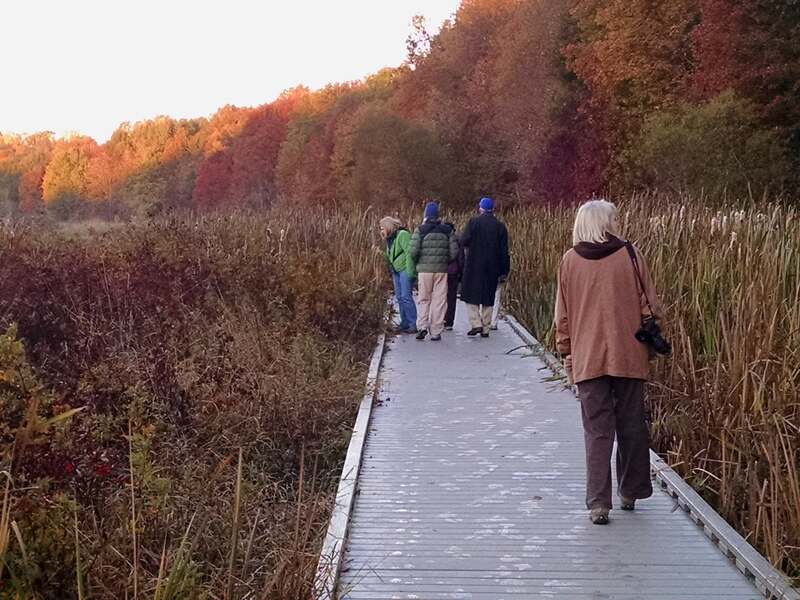 Birders at Huntley Meadows on the Monday Morning Birdwalk. A half mile boardwalk meanders through the central wetland beaver pond. • Filtering nutrients, sediment and pollutants from the surface and ground water. • Absorbing excess floodwater and rainwater. • Protecting our shorelines from erosion. • Providing habitat to numerous plants and animals, and nursery and hatchery areas for fish and shellfish, including species that area commercially harvested. Where are Virginia wetlands located? Since European colonization, 42% of natural areas were drained or filled for agriculture, industrial facilities, roads/ports, and urban/suburban development. The Virginia Department of Environmental Quality is responsible for ensuring the protection of more than 1 million acres of tidal and non-tidal wetlands. 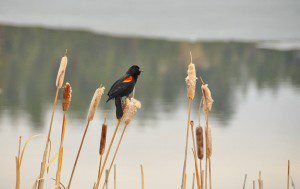 A male Red-winged Blackbird on a cattail at Huntley Meadows. At about 1500 acres, Huntley Meadows Park in the Alexandria section of Fairfax County is the best and largest local representation of a freshwater wetland in Northern Virginia. 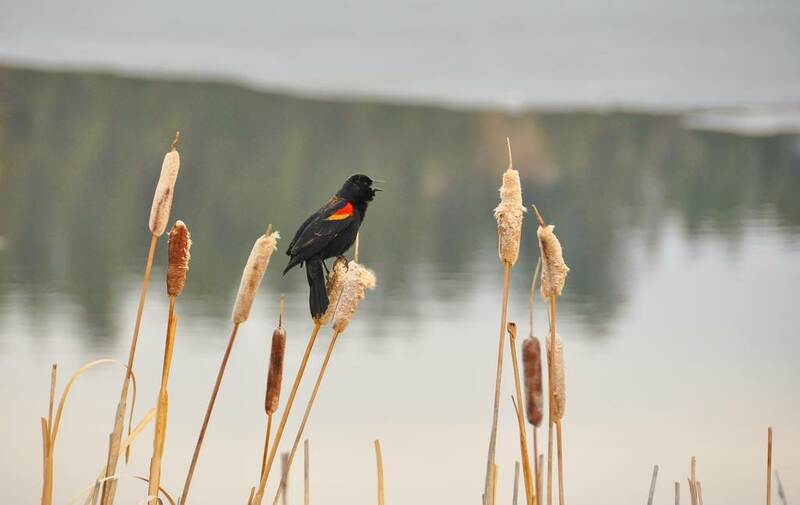 About half the acreage are wetlands of different categories. Huntley Meadows is a park in the Fairfax County Park system. It is on land once owned and farmed by George Mason. Over the years it was farmed by a long list of, owners. It was occupied by Union forces during the civil War. It was once considered a prime spot for an airport, and finally became federal property on which several uses were put. It was conveyed to Fairfax County in the 1960s, and grew to be one of the most popular parks in the region. 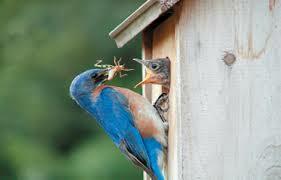 Eastern Bluebirds are well known residents at Huntley Meadows. Monitoring a trail of nest boxes is a popular volunteer activity. My husband and I have a small farm in Virginia. A creek runs through our land, and the “creek bottom”, which would be classified as palustrine, encompasses @ 6 acres. We have deer, opossums, otters, beavers, muskrats, foxes, and the occasional bear. The bird species are amazingly divers, and one neighbor said he spotted a Virginia rail. We put our land in land trust, so it can never be developed. On behald of the entire VNPS, I would like to send you our most heartfelt thanks! And thanks for taking the time to share this little bit of good news with us. Bravo!